• When John Mayberry Jr. doubled in the 10th inning for the Toronto Blue Jays on Friday, he became part of the first father-and-son combination to appear in a game for the club. His father, of course, manned first base for parts of five seasons with the Blue Jays from 1978 to 1982. For the record, Felipe and Moises Alou were the only father-and-son tandem to suit up for the Montreal Expos. Most remember the senior Alou as the Expos manager from 1992 to 2001, but he also played 19 games for the Expos in 1973. 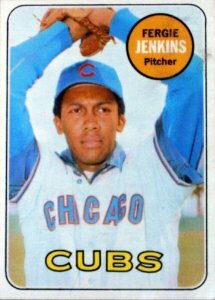 • One of the centerpiece artifacts of the Canadian Baseball Hall of Fame in St. Marys, Ont., is Fergie Jenkins’ 1971 Cy Young Award. In that remarkable campaign, the Canadian right-hander won 24 games and posted a 2.77 ERA, but most astounding to me is that he tossed 30 complete games that season. To put in perspective how impressive that is, Blue Jays pitching staffs from 2010 to present have combined to throw 24 complete games. • It’s nice to see ex-Jay Tom Lawless serving as the interim manager of the Houston Astros. The most vivid memory of Lawless for long-time Jays fans dates back to September 29, 1989. Heading into the season’s final series, the Blue Jays were one game ahead of the opposing O’s in the American League East standings. The Blue Jays were trailing the Orioles 1-0 in the bottom of the eighth inning in the first game of the series at SkyDome when Lawless pinch ran for Fred McGriff. The scrappy utility man promptly stole second base, advanced to third on George Bell’s ground out to shortstop and scored on Greg Olson’s wild pitch with Kelly Gruber at the plate to tie the game. The Jays eventually won 2-1 to clinch at least a tie for the division title. They won the following day to secure their second post-season berth. Lawless also played 11 games for the Montreal Expos in 1984. • So who has been the best Canadian player in the major leagues this season? Well, if you rank players according to their Wins Above Replacement (WAR) – an all-encompassing statistic that measures the numbers of wins a player (taking into account their offensive and defensive contributions) added to their team above a replacement level player (Triple-A player), Pittsburgh Pirates catcher Russell Martin (Montreal Que.) has clearly been the best. Here’s a list of the top five Canucks according to their 2014 WAR: Martin, 4.8; Justin Morneau (New Westminster, B.C), 2.5; Joey Votto (Etobicoke, Ont. ), 1.9; Brett Lawrie (Langley, B.C. ), 1.6; James Paxton (Richmond, B.C. ), 1.6. • Two Canadians were conspicuously absent from the list of September call-ups. Newmarket, Ont., native Pete Orr hit .301 in 113 games in a super-utilily role for the Milwaukee Brewers’ triple-A Nashville Sounds this season, while Jamie Romak (London, Ont.) who had 21 at bats for the Los Angeles Dodgers earlier this season, batted .280 and smashed 24 homers in 108 games for the triple-A Albuquerque Isotopes,. Sure, it would’ve required some roster shuffling, but both of these players could’ve helped their respective big league clubs down the stretch. • Does anyone out there know where I could obtain video footage of International League legend and Canadian Baseball Hall of Famer Rocky Nelson while he was with the Toronto Maple Leafs or the Montreal Royals? Whenever I mention Nelson’s name to seniors from Toronto that come into the Canadian Baseball Hall of Fame, they inevitably break into an imitation of Nelson’s unorthodox batting stance. I’ve seen the stance in photos, but I’d love to see it on video. • Your trivia question for this week: What two Canadians played their first big league game with the Toronto Blue Jays and their last big league game with the Montreal Expos? Please type your answers in the “Comments” section below. The winner will be the first person to respond with the correct answer in the “Comments” section. The winner will receive an autographed card of the two players that are the answer to the question. I think I know the answer….lets see what other say. Martin and Morneau are having great years, as is Axford. Saunders and Paxton are doing very well, but just haven’t been healthy. Thanks for the comment, Scott. WAR is not the be all and end-all, but I was surprised how much higher Martin’s was than Morneau’s. Rob Ducey and Denis Boucher? quiz answer: Denis Boucher and Rob Ducey…good question..
Hi Bill. You’re right! David Watson answered it just before you. Thanks again for your interest. Thanks for the comment, Devon. I think you’re right about the 30 complete games in a season. Thanks. 30 games is a amazing. You never see see 30 games again. Thanks for the info Kevin.